Senators have heavily criticised the Government for dishonouring its obligations under the 2015 Climate Act during a Seanad session on climate change that was “approaching farce” this evening. 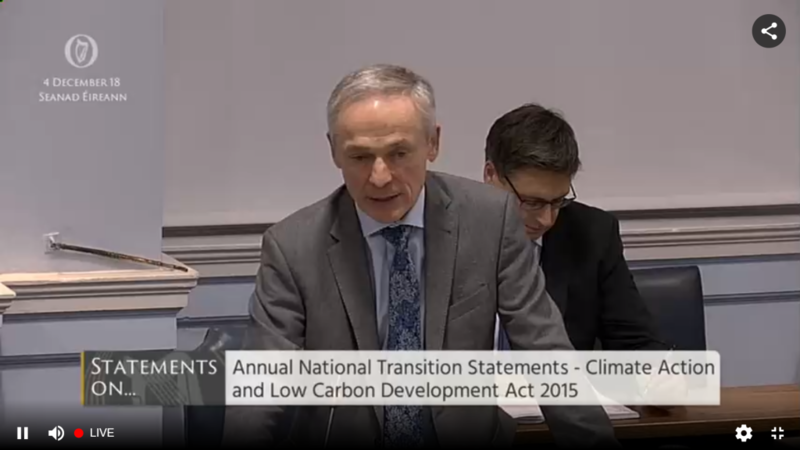 Earlier today, the Minister for Climate Action Richard Bruton TD and six others Ministers, including those responsible for housing, agriculture and transport, presented findings from the Annual Transition Statement as mandated under the Climate Action and Low Carbon Development Act 2015. 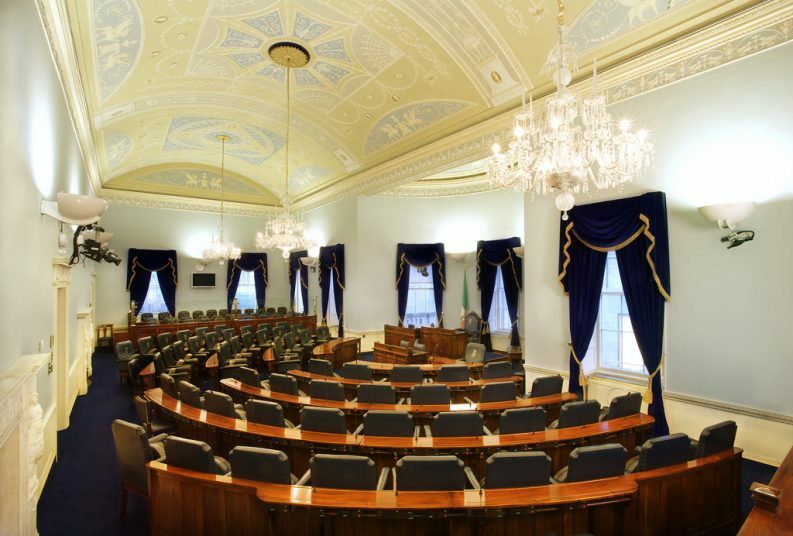 Section 14 of the Act states that Ministers must provide an oral report to both the Dail and the Seanad on progress with climate change mitigation and adaptation policy measures taken up by their departments over the past year. Following completion of their statements, all Ministers except for Mr Bruton left the Seanad Chamber. Mr Bruton then left halfway through the short debate to be replaced by the Minister of State for Financial Services, Michael D’Arcy TD. Senator Kevin Humphreys said that the Ministers’ actions show that they have failed to honour the Act and that the Government has “failed, failed and failed again” to provide clear plans, targets and reporting on its climate policies. Mr Humphreys, who was heavily involved in the drafting of the Act, said that he was “extremely angry” as he had “fought tooth and nail” to ensure that Ministers would be answerable to both Houses of the Oireachtas. “It is extremely disappointing to hear Minister after Minister come in here and say ‘everything is wonderful and we’re going to do better’,” Mr Humphreys said. “It’s just not good enough. “It is clearly laid out in the Act what was supposed to happen here today and you have dishonoured that legislation in word and in deed, and it’s just not good enough,” he added. Senator Victor Boyhan said that he was “disappointed” that the Ministers did not stay around to listen to the Senators and that “it says something about the importance of this issue” for the Government. “They came in relatively slowly but they got out pretty quick and they didn’t stay to listen to us,” Mr Boyhan said. He said that it was a “joke” that Mr D’Arcy was charged with responding the Senators when he was not there for the initial debate. “The Minister has come in here with a typescript to answer a debate he didn’t attend,” added Senator Michael McDowell, who said that there was “some degree of disquiet” over proceedings. The fact that the statement was only published at lunchtime today was “not satisfactory”, Mr McDowell said, giving Senators only a few hours to examine it and three supplementary documents. “It’s wrong that we are being treated in this way,” Mr McDowell said, adding that the approach from the Ministers was “approaching farce”. “This evening’s session has been prepared in haste and we have a list of bullet points from a whole series of Ministers with no response and no real input,” he said. At the core of the 2015 Act is a statutory recognition of the ‘national transition objective’ – the goal of pursuing a low carbon and climate resilient economy by 2050. The National Mitigation Plan, seen as a key policy move to reach this goal, has come under scrutiny from environmentalists, academics and the state’s own climate advisory body for a lack of ambition. Just over half of the 41 actions under the Plan that were supposed to be completed by 2018 have been followed through, Green Party Senator Grace O’Sullivan pointed out this evening. Incomplete actions include an examination of the impact of a carbon tax increase, finalising new wind energy guidelines and publishing a new public transport policy statement. “The National Mitigation Plan itself is inadequate to meet our targets, something both Minister Bruton and his predecessor Minister Naughten openly admitted,” she said. Senator Alice Mary Higgins said that this message was already alive over ten years ago at an Intergovernmental Panel on Climate Change summit she attended where countries agreed that the climate situation was urgent. “We are now past urgent,” she warned, adding that words and stories “are not sufficient” anymore as scientists warn that we have just 12 years left to take action to avert the worst consequences of climate change. “If you saw an action movie and there were only 12 minutes left and the protagonists hadn’t even begun running away from disaster, you would begin to doubt whether they would make it,” she said. At the start of this evening’s short session, Mr Bruton outlined that Ireland needs to step up and do more if we are to achieve our climate targets. During the recent economic crash, we were relatively in line with our targets, Mr Bruton said, but once the economic recovery took hold “we failed to break the link” between economic growth and rising emissions. Current projections, he said, indicate that we are likely to also achieve a one per cent reduction, leaving us 95 per cent off out 2020 target. 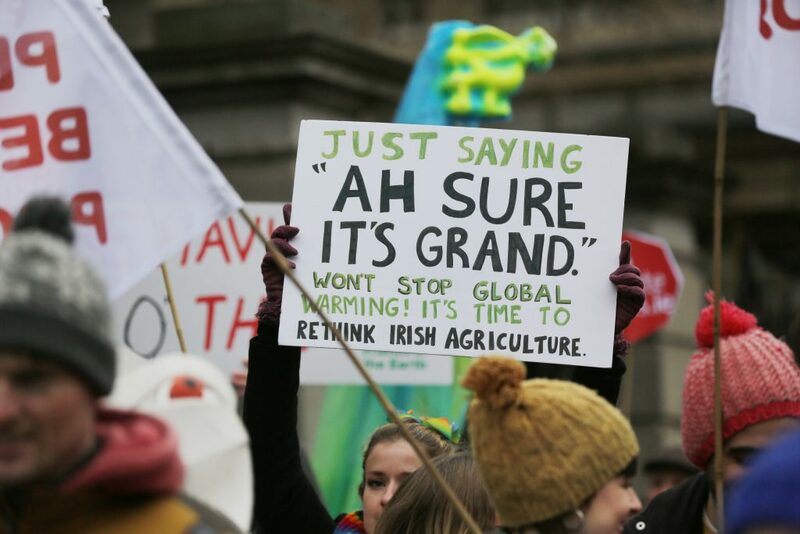 The statement was an opportunity to “commend” what Ireland has achieved recently, Mr Bruton said, and outline a future where Ireland plays a greater role in leading on climate action. This includes the securing of an “all of Government plan” to bolster Ireland’s role in tackling climate change, he said. The Government has also allocated €22 billion to climate-related investment in the new National Development Plan that will be spent between now and 2027, Mr Bruton added.